Sharon and Shane wanted to have a fun, intimate wedding for their special day. These two have known each other since Middle School - he had been friends with her sister. Their lives took them separate ways, until one day her daughter suggested she start dating again. She said she would only date if he knocked on her door. Well, guess who knocked on her door the next week? They reconnected and the rest is history. They had already chosen Joe T’s garden area for their reception and she wanted to play off the beautiful garden - it’s landscape and fountains. 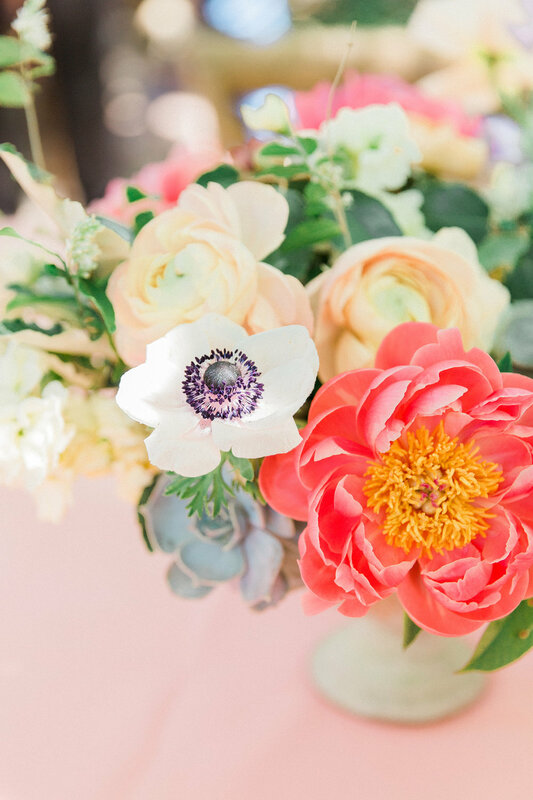 So we chose bright, colorful blooms - lots of peonies, garden roses and hints of succulents. For the ceremony we chose to continue the garden theme by having their ceremony outside in the garden of First United Methodist downtown Fort Worth and did a semi-circular arrangement to not distract from the gorgeous architecture of the Church. Peach and blues at the reception added a bit of fun and whimsy to the design.